Belt from the Kuba people of D.R. Congo, made of cowrie shells, beads, and natural fibers. The Kuba kingdom was founded in the 16th century by the Bushoong people. Artists from the Kuba kingdom are well known for the geometric complexity & elegant designs they use. Among their most spectacular creations are ceremonial clothing & adornment for the Kuba king & high-ranking officials of the Kuba court. 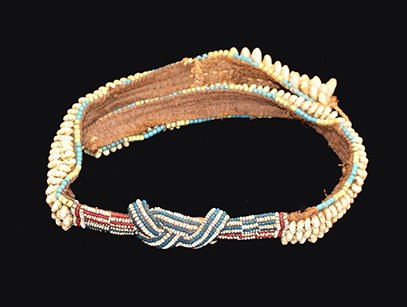 Belt ornaments, worn by royalty and noble men & women, vary greatly in form & in the bead and cowrie shell patterns. The Kuba King, the royal family, and members of the court would wear beaded clothing and adornment during state occasions. Provenance: Ex Private Collection. Collected about 50 years ago by a Belgian living in the D.R. Congo.